The Sergio Silvagni story mirrors that of thousands of European settlers in Australia following World War II. His parents had arrived years before the start of the conflict and settled in Carlton, but Sergio grew up in a time when his family’s homeland; Italy, had been a recent enemy. Team sports were a perfect a way of assimilating, so he took to the local game in primary school. By his late teens he was a standout in senior school football with Parade College, and in 1956 he was invited to try out in a practice match with the Under-19 squad at Carlton. With fifty players involved and changes only being made at the regular intervals, he didn’t get a run until after half time – only to be sent to full-back to play on the team’s gun full-forward. In Serge’s words, he “blitzed” the bloke because he was so annoyed at having to wait to get his chance. Only later was he told that the officials at the game knew he could play, but they didn’t call on him earlier because they couldn’t pronounce his name! The dark-haired, solidly-built kid with determination written all over him forced his way into Carlton’s senior team in 1958. Originally given guernsey number 20, such was his impact that prior to the ’59 season his coach Jim Francis insisted that he switch to number 1. By this time Serge was a rapidly-maturing 21 year-old, standing 183 cm. When not playing or training with the Blues, he continued working in his father’s concreting business – hard physical labour that paid big dividends in the powerful 92 kg physique he developed. By 1962 Silvagni was established among the very best ruck-rovers in the game and was selected in the Victorian State team. A one-pace performer, he ran and worked as hard in the last minute of the game as he had in the first. He was a superb team player and a strong, safe mark; when Serge took front position or swooped on the ball at ground level, only a Mack truck could shift him. He wasn’t quick, but he read the play superbly and revelled in the fiercest contest. Carlton made the 1962 Grand Final, only to lose to Essendon by 32 points, with Silvagni named among the best for the Blues. A couple of weeks later, Serge won Carlton’s Best and Fairest award with a record number of votes, polling in 19 of a possible 22 games. And in a portent of things to come, he had already developed a special on-field relationship with the Blues’ emerging champion ruckman John Nicholls. Two years on, the third member of perhaps the greatest ruck combination of all played his first game for the Blues. Adrian Gallagher came to Carlton from Yarram, and claimed a rover’s spot in the senior team from day one. From 1964 to 1971 Nicholls, Silvagni and Gallagher were the most respected on-ball trio in the game. Nicholls’ brilliant palming, Silvagni’s tenacity and Gallagher’s fluent disposal made them a potent combination. Serge was honoured with the captaincy in ’64, but the Blues had a poor year, finishing tenth before the sensational arrival of Ron Barassi in 1966 revitalised the club. Two years afterward, Carlton beat Essendon by 3 points in a dour struggle before a record crowd on Grand Final day to claim our first flag in 21 years. Serge was in his element in that ’68 Grand Final, and was among Carlton’s top half-dozen contributors. He then topped off a great season with another Best & Fairest award. In 1970 we saw him on the podium with a Premiership medal around his neck again, and with that infectious grin still in place after a herculean effort helping the Blues fight back to eventual victory from a hopeless position at half-time against Collingwood. In many ways, that was Sergio Silvagni’s (and Carlton’s) finest hour, because the whole team adopted “Silva’s” never-say-die attitude, and pulled off a football miracle. Aged 32, Serge wanted to retire after the 1970 triumph, but coach Barassi and the match committee talked him into just one more season. Somewhat understandably, the Navy Blues faded to fifth that year, despite another big-hearted effort from their socks-down champion wearing number 1. When Serge eventually called it quits, supporters from every club acclaimed him. There was open, genuine affection for a man from humble beginnings who made the Carlton Football Club – and the wider community – a better place by his presence. Happily, the Sergio Silvagni story did not end there. After 239 games and 136 goals, two Premierships, one year as captain, two Best & Fairest awards and two Big V appearances, he went on to further serve the Blues as a committeeman, selector and even a caretaker coach for three matches in 1978. 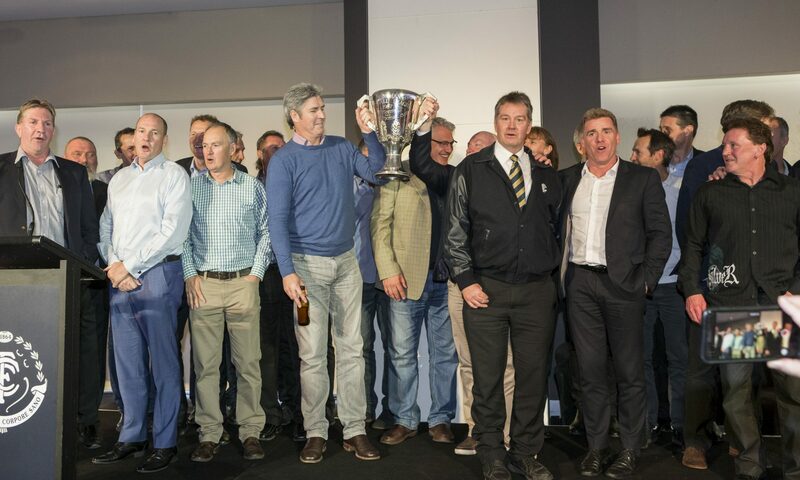 In 1989 he was elected to the Carlton Hall of Fame, and in May 2000 – when the Carlton Team of the 20th Century was announced – Nicholls, Silvagni and Gallagher were right where they richly deserved to be, as the team’s first ruck combination. Honours kept coming for Serge in 2007 when he was named on the interchange bench in the Italian Team of The Century. At full back in that side, as well as in the corresponding AFL Team of the Century, was Stephen Silvagni – the champion son of a champion father. Then in May, 2016 – only months after his grandson Jack Silvagni was drafted by the Navy Blues – Sergio was awarded the ultimate accolade for a Carlton player when he became an official Legend of the Club.